Jim Crow and other performances featuring white men in blackface captivated white crowds up until the mid-20th century. Note: This does make the Northam ads against Gillespie that showed minority kids getting run down by a dude in a truck with a confederate flag seem kind of rich. While blackface is considered “clearly racist” now, it was once celebrated. Of course, Liberals do this all the time, and it’s considered funny. Why so angry now? Leftists are the party of the KKK, campaigned against civil rights, and voted for and condoned slavery. Of note, a member of the KKK once sat on the Supreme Court of the United States. His name was Hugo Black. He was a Democrat appointed by “Progressive” hero, Franklin Delano Roosevelt. Northam is claiming that while he did once use blackface to dress up as Michael Jackson (can he can still do the moonwalk? ), he is not the one in the yearbook picture, “When my staff showed me the photo in question yesterday, I was seeing it for the first time. I did not purchase the EVMS yearbook and I was unaware of what was on my page” –Governor Northam. So, he essentially apologized Friday for not being in the picture? What? The problem for Ralph is that his party and the idiot progressive left has dog-whistled racism at every turn, and there is so much egg on their face, they may have to have his head. Just this week, the moronic team of CNN’s Andrew Cuomo and Don Lemon said that MAGA hats are a symbol of racism. Megyn Kelly had to resign just mentioning that dressing up for Halloween in blackface was okay. The Florida Secrectary of State resigned because of a blackface photo. Late Friday, calls for his resignation began to come in, including former governor Terry McAuliffe (D), state Senate and House Democrats, Virginia’s legislative Black Caucus and Planned Parenthood. The clown show of national Democratic hopefuls also weighed in—pressure built from ethno-huckster Sen. Elizabeth Warren (Mass. ), Sen. Kamala D. Harris (Calif.), who had an affair with the well-connected, powerful, much older and married Willie Brown as a way to sleep to the top, Sen. Kirsten Gillibrand (N.Y.), Sen. Cory Booker (N.J.), also known as Spartacus, and Julián Castro, a former mayor of San Antonio. Living on the Shore, I have met Mr. Northam many times at everything from town halls to oyster roasts, and while I disagree with him on policy, he is as far away from being a racist as anyone that I know. The photo is 30 years old, and while offensive to sensitive current progressive eyes weaned on the premise of constant wussification, identity politics, it is really just kind of goofy. Southern white boys get the irony and joke, sorry. What is more troubling is the question of why this is only coming out now. Who was holding this? Certainly, running for State Senator and eventually Lieutenant Governor, it would have appeared during those campaigns. Why now? Lieutenant Governor Justin Fairfax is far more progressive, more pro-abortion, and more indebted to Planned Parenthood, so for Liberals, even if Northam is ousted, it’s still a win. If Republican Jill Vogel had won, odds on the photo probably would never have surfaced. The cruel reality is that Northam will find that his so-called friends in the Democratic party are nothing but a bunch of back-stabbing, illiterate weasels who will throw him under the bus as fast a possible, hoping the stain won’t stick to them. He will get to feel what it is like to be a white, male conservative in Liberal America, and will have to endure the inane and vapid slings and arrows of the American Progressive Left. Isn’t this odd that CNN listed Northam as a Republican??? While the Mirror has issues with some of the Governor’s policies, it also understands that in reality, he hasn’t broken any laws (unlike Hillary Clinton, Bill Clinton and Obama), this is not Benghazi, nobody has died or has been assassinated. Classified information wasn’t breached from a home server, and as far as we know, Mr. Northam has not weaponized the legal branch for political purposes. The Republicans and fearful Democrats will pounce, but Northam should not resign over this. He should give the double-Bronx salute, and let them try and impeach. This can only occur if offense against the Commonwealth occurs by malfeasance in office, corruption, neglect of duty, or other high crime or misdemeanor. The two parties in a nutshell. With apologies to Emerson, Lake &Palmer! How surreal this all is, but hey, it’s America! Well said. I agree. Altho I disagree with Gov. Northam politics, I truly feel he is now feeling the ugly bullying of what politics has become. American politics has had ugly bullying right from the get-go, Jonny, from back when George Washington was president and Tommy Jefferson and John Adams were contending for the office, so this is nothing new, at all. Up here where I am, in the corrupt third-world ****-hole of New York which Ralph Northam is trying to re-create in Virginia, politics is considered a no-holds-barred, blood sport, and so the game is played. So again, what Northam is being put through here is not at all anything new. Now, Jonny, talk about someone telling us a huge WHOPPER, there’s classic case of it right there coming from out the mouth of this Tom Lopez, the Democrat party mouthpiece, given that the Democrat party is the party of slavery here in America, the party that seceded from our Republic so it could have its own country where slavery was allowed, and the party that gave the black folks “Jim Crow” and terror gangs like the Red Shirts of the Southern United States which were white terrorist groups that were active in the late 19th century after the end of the Reconstruction era of the United States. The Red Shirts first appeared in Mississippi in 1875, when Democratic Party private terror units adopted red shirts to make themselves more visible and threatening to Southern Republicans, both white and freedmen. The Red Shirts were one of several paramilitary organizations, such as the White League in Louisiana, arising in the continuing efforts of white Democrats to regain political power in the South in the 1870s. While sometimes engaging in violence, the Red Shirts, the White League and similar groups in the late nineteenth century worked openly and were better organized than the secret vigilante groups such as the Ku Klux Klan. They had one goal: the restoration of the Democrats to power by getting rid of Republicans, which usually meant repressing civil rights and voting by the freedmen. During the 1876, 1898 and 1900 campaigns in North Carolina, the Red Shirts played prominent roles in intimidating non-Democratic voters. Two classmates of Northam’s at Eastern Virginia Medical School said Saturday that they had never seen him in costumes like those that appear in the photo on his yearbook page. However, they were at a loss to explain how a mix-up might have occurred that would result in the racist image being placed on his page in error, because students were responsible for submitting their own photos. Tobin Naidorf, who also graduated in 1984 and is now a gastroenterologist in Alexandria, said he did not recall the exact procedure for submitting photos to the yearbook staff. However, he said he was the only person who could have submitted the family photos that appeared on his own page. “I can’t speak for Ralph, though,” said Broadnax, whose entry also included a favorite Langston Hughes poem. He doesn’t remember how the yearbook was created or even seeing it once it was published. As I said above here, this **** is simply surreal! BTW…I don’t want him to resign. NY & CA should not be dictating our political leaders. If people are calling for the resignation of Northam because of the photo from many years ago, why not an equal or greater call for the resignation of our president who has more than once expressed his disdain for nonwhite people. Really(? ), show the reliable documented proof of your accusation. Now, for those too young to remember, Lyndon Baines Johnson was a DEMOCRAT! Sounds like what people say about Trump, does it not? As an aside, although after all these years gone by with no answer forthcoming, I don’t expect one now, why is it alright for a Democrat to be a blatant racist, while nobody else can be one? And more to the point of this exercise, why was it alright for LBJ, a political father-figure in all likelihood to Democrat Ralph Northam, to be a blatant racist, but it is not alright for the political acolyte to follow in his footsteps? As an aside, I wonder if ol’ LBJ came up with those classic Democrat lines on his own or if they were really Pierre Salinger’s, but there is a question we will likely never know the answer to now, is my thought. So it is alright for Democrat LBJ to have been a racist, and it is alright for Democrat Ralph Northam to advocate the killing of babies, but it is not alright for Ralph Northam to have a picture of a dude with his face smeared up with shoe polish on his medical school yearbook page. Who is it that thinks all those rules up in the first place, I wonder. Maybe some Democrats out there could do us all a great big favor and come in here and explain all of that to us. There’s a whole lot of things going on here, Christopher. This is like being alive in Rome during the reign of Caligula, or Nero – totally strange things going on, alright, and this latest business with Ralph Northam just about takes the cake, given what I am reading about it in the Washington Post article “‘The picture’s not me’: Va. Gov. Northam refuses to step down, despite flood of calls for his resignation for ‘racist and offensive’ photo” by Laura Vozzella and Gregory S. Schneider on 2 February 2019, which incidentally is a developing story and that will be updated, as you would expect of a ripe, juicy political drama like this one is, something that writes itself so the members of the press don’t have to do anything more than write it down as it comes at them, and then hope that people believe it and take any of it seriously. First of all, Christopher, go back up and take a close look at the “offending” photograph and tell us what you honestly see. The supposed Klucker in the photo looks like a cardboard cut-out caricature of a Klucker, and the black-face dude is smirking about something. So who is getting offended by that, and what exactly is it that they are getting upset about? I think it is GOOFY! And WTF was it doing in a MEDICAL SCHOOL yearbook in the first place? What the hell kind of medical school would want a picture of a couple of GOOFBALLS in its yearbook as an advertisement of the kind of medical talent they are turning out? Like something out of a John Candy/John Belushi movie, isn’t it? And let me say that I still remember when Amos and Andy was a very popular radio and TV series here in America, and yes, the TV version featured real black people, not white dude wannabees wearing shoepolish, and there was no hue and cry about that as there is now, over this faux black dude in a medical school yearbook. Are you following that, Christopher? The picture was never hidden – people have always known about it, and never before this did anyone have a problem with it. She said she didn’t know when or where the photos were taken. Her husband, Tobin, wasn’t available Friday. He met Northam a few times when they worked medical rotations together but weren’t friends, Joan Naidorf said. Eastern Virginia Medical School allowed students to pick their own photos for their yearbook page, Naidorf said. Her husband chose their engagement photo and other personal pictures. Another student chose a picture of men in blackface and dressed as women in what appears to be a variety-show routine. So what is up with any of that, do you think, Christopher? And how is it that after all this time of that same photo being part of the public record, always easily available to anyone wishing to do even basic research on Ralph Northam, which would include his yearbooks, somebody makes a big deal of it now? You see that, Christopher – it was never hidden, so why now? The revelation comes after a wild week for Northam, who was accused by Republicans of advocating infanticide after he made comments defending a bill that would have lifted restrictions on late-term abortions. The Northam dude was advocating killing babies in Virginia, which the Democrats had npo problem with, and now those same Democrats want Northam gone because of that photo they have known about all along. Is that hypocrisy, or what? Bob Holsworth, a veteran analyst of Virginia politics, the photo could change state politics. “He would have never received the Democratic nomination if this photo had been exposed early enough in the campaign against Tom Perriello,” he said. “It certainly damages his perception,” Holsworth said. What damages his perception is the fact that he wants to allow the killing of babies, not whether he was stupid enough years ago to daub himself up with black shoe polish to smile at the camera, even assuming it was him in the first place, as opposed to someone else entirely. So you see how bizarre this is all getting, Christopher? Plenty so, is it not? I’m not gonna bother to defend or accuse Northam. He lives by the sword so he dies by the sword. He’s part of the p.c. crowd and the democrat party. They kill babies and eat their own. He could have taken a diferent path, and chose not to. To me it’s all part of their growing agenda that I see, and the play they are putting on for us. Democrats, the p.c. crowd, liberals in general, and hollywood liberals all make me laugh at their, what I think, is total two faced nonsense. All the dancing and posturing they are performing trying to protect the democrat party and the Clintons is amazing. I believe/hope it will all come out in the long run, and we will see what happens. Today is a perect example. They want to fry northam for what he did many years ago, and I have to endure the commercials on t.v. tooday laughing in my face. Waiting for the Super Bowl to come on and I see a great Hollywood liberal pushing some bank. Samuel Jackson. His loud mouth about this n that and how insensitive and cruel white people are has been screaming to be heard for a long time. Today, in a big time commercial, and screaming in my face, (that’s how I feel) he tells a white man that he “is simple”. He covers his tracks by then saying he is smart too. Am I sensitive ? Should I SCREAM the race card and call the bank and Jackson a bigot ? Or, as an intelligent white Irish Catholic independent thinker, should I smirk at the nonsense and just change the channel ? The latter is what I think Mr. Northam done a long time ago. Not him. he jumped on board. His further political aspirations got him. So be it. In the meantime folks, I have yet to tell you the real subject of this comment. I wrote the other day and said it’s all about the benjamins, Mr. Northam falling on his sword and pushing the liberal agenda more forward. Wait for it…….. In my opinion dems have beem sitting on this Northam story for a long time. They decided this is the time to bring it out. Northam brings out the abortion story and falls on his sword. Many Americans are horrified at the idea, and the dems knew we would be. So they quiet that, and then bring out this photo story and will soon drive a stake through the governors heart. His wife supports him,as does his pastor, but in the long run dems prove their desire to unite and move forward. It’s all easy to do to an E.s. out of mainstream richmond guy anyway. and he resigns. What a docudrama……. All the dems push for Ralphs resignation. they paint him into a corner. Even Planned Parenthood comes out and condemns him. as if they have morals. Me ? I’m LMAO at all this. Planed Parenthood keeps trying to look like good folks while they harvest ste cells from fetuses. the more abortions we perform, the more stem cells the get and cell to med companies, and they take the $ and donate it to democrats. Ho hum. Anybody paying attention yet ? The agenda gets further pushed. Gee, what a surprise, the country now gets a new black governor. Is this a win, win, win for libs and dems ? Wait for it……..Ralph will emerge at some post somewhere and probably making more $ than as a governor. With all the $millions the Clinton Foundation now has that disappeared from there, they can easily reward him with a cushy job somewhere. Skirt the law, help Russians buy uranium that they sell to the middle east, they reward Ms. Clinton wiith $millions. Barack got his cut, and now, through McCauliffe, (Hillary’s buddy) Northam will get his. And the press riles people up over a KKK/blackface photo. it’s called a smokescreen folks and they threw the Trump/Russian hoax in your face early to really distract you. God Bless America. Do yourselves a favor. relax, laugh and watch the game. You can’t affect it. I think my namesake is trying but it’s hard to hold back tide. My GUESS ? Patriots 33 and Rambos 27. It’s hard to not pick the Patriots. Gov. Ralph Northam of Virginia had a fragile, defiant hold on power on Sunday as he and a quickly eroding coalition of allies rebuffed demands for his resignation after the revelation of a racist photograph on his medical school yearbook page. Mr. Northam’s hopes for political survival, Democratic and Republicans officials increasingly believe, are a mounting humiliation for the state, and risk his fellow Democrats’ policy ambitions and their aspirations for crucial state elections this year, when all 140 legislative seats will be at stake. Democrats fear that if Mr. Northam remains, he will prove a drag on the party’s fund-raising and jeopardize its efforts to persuade voters in a year when control of both legislative chambers is expected to be bitterly and closely contested. Ah, yes, Jack – do not, above all else in politics today, do not disturb or upset in any way the MONEY MACHINE that brings money into the party coffers, because it is about party before country when you are a party hack, which the Democrats clearly think Northam is. It is not clear how legislators and other state leaders, like Attorney General Mark R. Herring, will proceed if Mr. Northam continues to insist on staying in office. Scholars and Virginia officials have been studying the State Constitution and its provisions to oust a sitting governor. If Mr. Northam chooses to remain in office and legislators ultimately seek his impeachment, the House of Delegates would be the first legislative chamber to consider the matter. The Senate would conduct any subsequent trial and determine whether Mr. Northam kept power. The Virginia Constitution also offers a second, equally disruptive mechanism that is similar to the United States Constitution’s 25th Amendment. In such an instance, which can also be prompted by a majority of the Legislature, the lieutenant governor becomes the acting governor. Mr. McAuliffe said he did not anticipate there would be any proceedings like impeachment. “I know Ralph very well,” he said. “I pray Sunday will be that day,” said Tom Perriello, the former congressman who ran against Northam in the Democratic gubernatorial primary in 2017. “It gives me no pleasure to say that what we’re seeing is the manifestation of white male entitlement,” Perriello continued. “White male entitlement,” Jack – there perhaps is what this is really all about – Northam is a symbol of white male entitlement in America, so that is why he has to go. According to the news I am reading, Northam is in real serious trouble here, and frankly, it is surprising he has lasted the day, and as can be expected in these political dramas, there is a sub-plot now swirling about the Lt. Gov. and a sexual assault, but the dude was just on the news saying there was really nothing to it, just politics, and they are bringing it up now because the dude might be governor, so that is that. According to the New York Post article “Ocasio-Cortez, Clinton join in calling for Ralph Northam’s resignation” by Tamar Lapin on February 3, 2019, with Hillary Clinton and Democratic Socialist political superstar Alexandria Ocasio-Cortez on his back now, Northam is seen as done here, big-time. According to the Post, freshman New York Rep. Alexandria Ocasio-Cortez and former presidential hopeful Hillary Clinton are joining the chorus of prominent Democrats calling for the resignation of Virginia Gov. Ralph Northam over a racist photo from his medical school yearbook. Ocasio-Cortez, of course, is a congresswoman from Queens, which happens to be in New York City, not Virginia, and it is for that reason that she would know better what is good for the Commonwealth of Virginia than would the people who live there and are too close to the situation to know what is best for them, and besides, it is a good way to keep your name in print if you want to continue to be a left-wing media darling like the Democratic Socialist congresswoman from Queens with her warning that I am taking seriously that Northam must resign, and those who try to help him stumble past this deserve scrutiny. “He must resign,” Hillary Clinton tweeted Saturday night. That is what made Hillary such a powerful presidential contender all those times – her ability to act forceful, and presidential, as she is doing there. And if that combination was not enough, according to the Post, presidential hopefuls including Sens. Cory Booker (NJ), Sherrod Brown (Ohio), Kamala Harris (Calif.) and Elizabeth Warren (Mass.) have also called for his resignation as did House Speaker Nancy Pelosi and former Vice President Joe Biden. It was Nancy Pelosi, as we recall, who was the critical voice in getting Anthony Weiner to resign from congress after photos of the dude’s “muscle of love” as he called it went viral, so people are wondering what impact it will have here, where Northam’s alleged sin is considered far more serious than anything Weiner did, because Northam’s alleged sin is considered racist, while Weiner’s was not. According to an article in The Atlantic entitled “The Weiner Shot That Pushed Pelosi Over the Edge – She sought his resignation following the circulation of an explicit photo” by John Hudson on June 17, 2011, a key actor behind Rep. Anthony Weiner’s resignation was House Minority Leader Nancy Pelosi, reported Politico’s Mike Allen, with it appearing that the moment that convinced her the New York Democrat had to step down was when an X-rated picture of his nether regions was leaked to the radio DJ’s of The Opie and Anthony Show and spread across the Internet. Interestingly, as some may recall, the explicit photo (of Weiner) was never supposed to be published at all. Conservative blogger Andrew Breitbart said he was holding it as an “insurance policy” in case Weiner continued to deny the allegations against him and depict Breitbart as a liar. But Weiner didn’t do that. Unfortunately for Weiner, Breitbart showed the producers of the Opie and Anthony Show the photo and they surreptitiously snapped a photo of the picture during that screening, according to Breitbart. Little did any of them know the photo would then move Pelosi to call for Weiner’s resignation. And in this case, the yearbook image was first posted Friday by the website Big League Politics, a conservative outlet founded by Patrick Howley, and he was a former writer for the Daily Caller and Breitbart, so how about that for a coincidence! Embattled Virginia Gov. Ralph Northam huddled with his cabinet and staffers Monday and asked for more time to make a decision as pressure continued to build for him to resign over a racist photo in his 1984 medical school yearbook. And Sen. Chuck Schumer, the Senate Democratic leader, added his voice to those urging Northam to step down. “Governor Northam should resign so Virginia can move forward,” Schumer of New York wrote on Twitter. Former Virginia Gov. Terry McAuliffe said he believed his fellow Democrat will ultimately “do the right thing” and resign. “And I think that will happen relatively soon,” McAuliffe said on CNN’s “State of the Union” on Sunday. “You know if you put black paint on your face,” he said. McAuliffe, who helped Northam win the state’s top office and under whom Northam served as lieutenant governor, said on Sunday that he was “heartbroken” over the discovery of the photo. But he said Northam’s insistence that he was not in the picture was irrelevant. This article is a little politically biased.. just a little.. nonetheless, Northam knew better at the time of this photo. Most will agree that your mid twenties is long enough to understand what is innappropriate and what is not. I see how this can be interpreted as a way of showing a type of humor, a way of showing how absurd rasism and predjudice is and that we have accepted the realities of the past to a point where we can make fun of it with a show of costumes and face paint. Maybe it reflects that we can all get along after all, and that we stand together as one people. And then maybe the picture shows the opposite—that we still cannot accept this type of behavior, even 30 years ago and today. I think we have to make up our minds on how we will treat things that have already happened and how we will treat future instances of it. The key is that there can’t be a double standard and that cognizance of its existence, even in current times, should be met with responses that respect those offended by it and also gives those who did offend a way to rehabilitate. Your’s is an excellent essay as well, Jimbo, with regard to the important points you raise in here vis-a-vis most will agree that your mid twenties is long enough to understand what is innappropriate and what is not and the fact that some day, we in this country will finally have to make up our minds on how we will treat things that have already happened and how we will treat future instances of it. And that thought brings us to Al Jolson, born Asa Yoelson (May 26, 1886 – October 23, 1950), who was an American singer, comedian, and actor. In the 1920s, in fact, Jolson was America’s most famous and highest-paid entertainer, so talk about a cultural figure in American history, Jimbo, he was it. As to Jolson, he has been called “the king of blackface” performers, a theatrical convention since the mid-19th century. With his dynamic style of singing jazz and blues, Al Jolson became widely successful by extracting African-American music and popularizing it for white American audiences who were otherwise not receptive to the originators. Despite his promotion and perpetuation of black stereotypes, his work was sometimes well-regarded by black publications and he has sometimes been credited for fighting against black discrimination on Broadway as early as 1911. So, back in the 1920s, Jimbo, the black folks of that time were grown up enough and mature enough to be able to laugh at a white Jewish man trying to pretend he was black so he could be popular singing black songs to white audiences. What has happened in the interim, do you think, that now has black people so emotionally weak that they are literally crushed by seeing some moron with a can of beer in his hand and shoe polish on his face in a medical school yearbook? O Dear hear we go again in all my life i have never read so much B/S regarding so called radical nonsense from so called educated people who should be embarrassed to even put pen to paper. Rick, all in all an excellent essay wherein you raise a lot of important points, starting with this thing of “race,” and how surprising, and yes, even amazing it is that so-called “educated” people in this country still do not realize, as strange as that is, that regardless of skin color, which, as you take pains to make clear, is superficial, there are not different races of human beings. Somebody with black skin belongs to the same human race as someone with yellow skin, or white skin, elsewise, how could we account for Barack Obama? What is truly stupid coming at us in barrages from the juvenile and adolescent main-stream media is all this talk of people like Obama or Kamala Harris being “bi-racial,” when nothing could be further from the truth. So why do they continue to do it, Rick? Having stepped up to the plate here on that issue, let me tell you that the candid world is hoping you are going to put that fallacy to rest in here for once and for all. Members of the state legislature’s Black Caucus spoke of how they felt profoundly let down by Northam, who had worked alongside them on key legislation. “We feel complete betrayal,” the caucus said in a statement. A piercing reminder of this nation’s “sins,” Rick? Surely, you are not just mindlessly buying in to that crap spew, are you, Rick? Is “slavery” a “sin” of this nation, Rick? Is that also a “sin” of this nation? Or are they really “sins” of the Democrat party? And if they are sins of the Democrat party, why then are they being blamed on the nation? Why are these people chained to four hundred years of hate? Why is something that happened 400 years ago somewhere in the world an “albatross” around the neck of anyone living today? And what about the meaning of that phrase, Rick? Literally, the phrase “albatross around the neck” refers to an annoying burden, and the phrase alludes to Samuel Taylor Coleridge’s poem “The Rime of the Ancient Mariner,” in which a sailor who shoots a friendly albatross is forced to wear its carcass around his neck as punishment. Given that, Rick, what is it these members of the Virginia state legislature’s Black Caucus are being punished for here, do you think, that they have had to wear an albatross around their necks for four hundred years now? I’m one of those people who really doesn’t care what is in my DNA. My blood is no more or no less red than anyone else’s, and no one has DNA that is better than anyone else’s, and besides, all blood that is passed down comes from the mother, so if the first mother was black, then we are all soul brothers, Rick, so how about that? Thank you for your constructive comments . So lets step back about to the Roman Empire several thousand years when Slavery was a common practice but this time these were not Black White Slaves . now you should look into where Human life started Or Began some Million years way before the Word Christ was formulated , Each of us White People have a Very small Percentage of so called African blood , .now you my Laugh at this statement remember the Romans and Egypt were formed with a mixture of Central African tribes Centuries ago . in closing check your DNA and start to trace your Heritage you will be very surprised. Also take a very close look at Prince Harry and his new Bride she is part Black .hard to tell , Now visual appearances can change from one generation to another now multiply by a million years , get the picture . Rick, while we are sitting here watching the top leadership of the Commonwealth of Virginia, the “Old Dominion,” melt down and self-destruct right before our eyes, what, pray tell, is this fascination in this country with Meagyn Markle and Prince Harry, do you think? There are those who would kick if they were playing football, Rick – negative people who have a perverse need to be an eternal victim of something. RICHMOND, VA (WWBT) — The Rev. Al Sharpton didn’t hold back on his thoughts Thursday about the controversy surrounding Virginia’s top leaders. Uh, yeah, okay, Reverend Al. Outside of you, who cares if the due made himself look stupid putting black shoe-polish on his face to look like Michael Jackson when everybody knows Michael Jackson was getting his skin bleached so he could look white. “I flew out of New York to tell you that your political days are over and you need to go on to another life,” Sharpton said. What do you think is up with that, Rick? Where does a hate-filled little pipsqueak like Reverend Al Sharpton of New York get the right to tell an elected official in another state he has to leave office, or else? Gathered on the campus of Virginia’s oldest historically black college, black leaders on Thursday escalated calls for Gov. Ralph Northam to resign. Local, state and national officials converged on Virginia Union University’s weekly chapel service to respond to Northam’s use of blackface in 1984 at a dance contest, an accusation of sexual assault against Lt. Gov. Justin Fairfax, and an admittance Wednesday from Attorney General Mark Herring that he, too, had worn blackface at a college party. “It’s not by chance that God pulled back the covers in Virginia, the capital of the Confederacy,” said Del. Delores McQuinn, a Richmond Democrat who is a member of the Legislative Black Caucus. Now, help me out here if you can, Rick, with regard to acknowledging that Virginia was the capital of the confederacy. I thought everybody already knew that, because it is taught in what, the 5th grade? So what is up with this statement of this Del. Delores McQuinn, a Richmond Democrat who is a member of the Legislative Black Caucus, that the only way “we can get beyond it” is to acknowledge that Virginia was the capital of the confederacy? If everybody, including her, already knows that Virginia was the capital of the confederacy some 156 years ago now, what is there left to acknowledge? What is this fixation these people have with Virginia being the capital of the confederacy? In conclusion lets but this redundant controversy behind us i my self have lived in many areas of the World an d have never seen the kind of retroactively except in the Poorest parts of of North Africa & Egypt and i am a right wing Conservative .there are no free lunches . i started from the very bottom in 1947 twelve hour days and week ends to own two corporations retired 23 years ago..
Rick, let me say here that I am honored to have made your acquaintance through the Cape Charles Mirror, and I salute you on your success in life through your own hard work, which used to be the definition of “the American way,” to work for something as opposed to begging for it from the hand of a master, or hoping for it, from the hand of a messiah. How many of our modern-day politicians is he talking about there, Rick, besides most of them? Why was the photo released now?? It was released now because of the bill he supported allowing infanticide. Do we really want a bill like that in Virginia? A pregnant woman was murdered two weeks after the New York bill passed. Her killer will not be charged for the death of the baby. Shortly before he tried to pass his murder bill, he attempted to pass red flag gun laws. If you are from the Shore, I can’t see thinking this is ok either. The Democratic Party has sealed Northam whole. They can have him! Ralph Northam likely saw all the love there flowing towards Young Andy in that video, and being only human, and as the Reverend Al Sharpton says, a sinner, to boot, it is understandable that he would crave some for himself, the adulation and cheering fans, I mean, and so, he stepped up to the plate here in Virginia, and by doing so, he has perhaps hastened his political doom, although in truth, that remains to be seen. That is what Democratic Socialist Young Andy Cuomo did in New York state and that is what Ralph Northam wanted to do in Virginia, and le voila, along comes that picture which has never been either a secret or a political problem, but now, thanks to him wanting to make Virginia like New York under Democratic Socialist Young Andy Cuomo, it is, although it looks like Northam is going to stay on, so perhaps infanticide in Virginia won’t be a dead letter, afterall, but for that we will have to wait and see. Cuomo further angered pro-lifers when he ordered that major landmarks in New York City, including One World Trade Center, be lit up pink in celebration of the Act’s passing. “The Reproductive Health Act is a historic victory for New Yorkers and for our progressive values,” said Cuomo. Albany – On the day he signed the Reproductive Health Act into law, Gov. Andrew Cuomo ordered Manhattan’s Freedom Tower and Albany’s Alfred E. Smith Building lit with pink lights in celebration. You can count Assemblyman John McDonald, the Democrat from Cohoes, among those who believe the governor’s move was disrespectful. “Lighting up the buildings and running around celebrating abortion is not something I support,” McDonald told me Wednesday. McDonald voted for the law, which expanded abortion protections and removed abortion from the criminal code. But he is sensitive enough to those who oppose abortion as a deeply held conviction to believe that rubbing salt in their wound is ungracious. But such is politics in the age of Cuomo and Trump, when policy wins are conflated with the vanquishing of opponents. I am going to speculate here that it was this totally “ungracious” (rude, impolite, uncivil, discourteous, ill-mannered, bad-mannered, unmannerly, uncouth, disrespectful, ungallant, insolent, impertinent, impudent, churlish, boorish, gauche, cavalier, ungentlemanly, or hostile) behavior on the part of Young Andy Cuomo with those pink lights that helped to fuel the indignation in Virginia that brought forth the blackface photo. In Cuomo’s case, this winning-without-grace approach has led to a remarkable war of words with the leadership of the Roman Catholic Church. For some in the church, it was a slight too far. That highlights the risk Democrats face when they aggressively antagonize Catholic voters and the faith they hold dear. 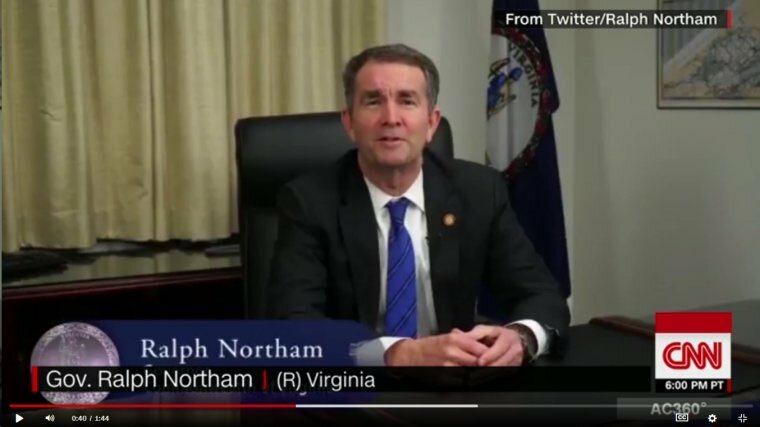 Did this contribute to the backlash against Northam in Virginia? An interesting question for our times.